Two clients have launched a new website this week. I enjoyed working on both sites and wish them much success! The first, Collaborative Psychiatric Care, is a one-page site with plenty of growth planned. 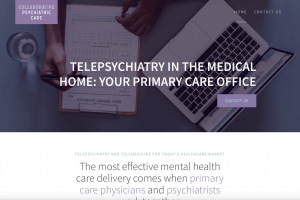 They’re a new business, focused on telepsychiatry and collaborative care. If you’re like me, when you think of psychiatry, you visualize the patient on the couch, lol. I didn’t know that, in the evolving world of telecommunications, patients are actually having video sessions with a therapist. Interesting concept… You can find the new Collaborative Psychiatric Care website at collabpsychcare.com. The second is American Concepts, a small business focused on promoting “Made in America” products. The owner, John Sajjadi, is a wonderful man who is passionate about the quality of American-made products and the effect that U.S. job creation has on the economy, families, and our communities. 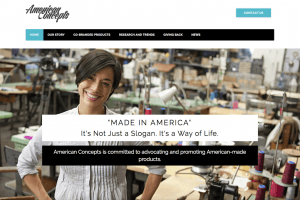 American Concepts offers custom, co-branded items with the “Made in America” theme. You can find their new website at theamericanconcepts.com. I love helping a fellow human to bring their vision to life. Everyone has a dream and a desire to make a difference in this world. With 1.5 billion websites on the interwebs, your ability to rise above the fray will require a compelling website that immediately conveys what your business is about and what you stand for. Honor your mission; make sure your website truly speaks for you. Sure, gaining traffic is also important, but we all know that driving thousands of visitors to an unfocused, unprofessional website will defeat your purpose and cause folks to immediately back out and head somewhere else. Honor your mission; make sure your website truly speaks for you and your content reflects the integrity and value of your product or service. It brings me joy to play a small part in helping clients to communicate and visually express the heart of their unique mission. If you have a business or non-profit organization and need a little help with building/improving your online presence, developing optimized content, or creating powerful and concise communications, check out the services I offer and get in touch. Are You a Difficult Client? Tangerine Web Works - Web design and communications in Arlington, VA.